Happy Monday! This was supposed to post on Friday, but I fell asleep at my computer, so we're just going to consider this an extension of Dragon Lord Week, which works because the awesomeness of The Dragon Lord Chronicles can't be contained in a mere 7 days. Dragon Lord Week has been an absolute BLAST. It started off last Monday with my review of the first 3 books in The Dragon Lord Chronicles. Then on Thursday, Miles O'Neal - the author of The Dragon Lord Chronicles - sat down with us for an Author Q&A. Now, today, I've got a special edition of The Cat's Meow, a series of blog posts in which my cats give their .02 on the books we've been reading. I say "the books we've been reading" because my cats are super smart and are particularly fond of curling up with my books... preferably whatever book I'm trying to read at the moment. So, you may be wondering, what makes this edition so special? It's authored by none other than Bagheera, my beloved cat who died unexpectedly last August. When his brother, Mojito, was going through Bagheera's personal effects a few weeks ago, he found this draft and I just so happened to have a photo of Bagheera with Year of the Dragon Lord, so it was clearly meant to be. I regret that Bagheera will not be able to join our staff on an ongoing basis for obvious reasons, but I'm happy to bring you his last writings. 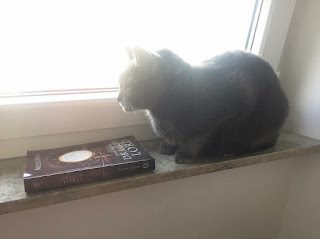 Bagheera was a wonderful cat who has been greatly missed since his passing, and it brings me some small measure of comfort and a great deal of delight to be able to share his thoughts on The Dragon Lord Chronicles. So. What did Bagheera think of The Dragon Lord Chronicles? "This series is a solid 9.5 meows out of 10. As with meowst of the books Esther reads, there is a regrettable lack of mice, but I feel like the abundance of bacon almeowst makes up for that shortcoming. The dragons give the impression of being inspired by cats, which is meowvelous. Perhaps in the one of the later books we'll meet a dragon named Bagheera. That would bump meow rating up to a good 11/10. I will say this book makes a meowst excellent pillow. Just the right size, and cushiony for a book. Very thoughtful of the author. Maybe I should bump the rating up to 9.75. MEOW!" Well, there you have it. The Dragon Lord Chronicles is The Cat's Meow. Tune in next time, and have a lovely week. In loving memory of Bagheera, 2008 - 2017. AKA Baggy-Boo, Bagheera BooBooKins, Boo Boo. A patient cat who loved to sit on my books as I was reading, or my laptop as I was typing.